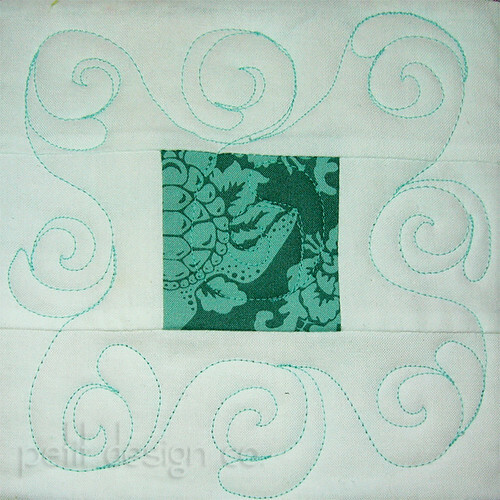 This isn’t the best picture, or the best quilting, but it gives you an idea of what I’m doing on the Neptune quilt. I mentioned before that I hadn’t done any quilting in over a month, and it shows! I can tell where I hesitated or didn’t quite get back on my quilting line. I’m using a beautiful aqua blue thread for the whole quilt (Essential Pro Ocean Mist by Connecting Threads $5.99 for 3,000+ yards.) Yes! Even on the white. I’m living a little on the wild side, or stupid side… depends on how you look at it. At first I was really doubtful of my choice but once I got going I just love it.The blue matches very well with the aquas in this fabric collection. You can’t tell very well from this picture, but there is a swirl on the center print. P.S. I would love to answer any questions for you. I’m not by any means an expert but I’ll give you my best answer and why I do what I do (usually it’s because I don’t know any better!) Someone asked me about my machine set up so I’ll be doing a post on that shortly. I think your design practice is looking great! !